After years of being out-of-print on vinyl, ‘tis the season for Universal Music Group to reissue the original soundtrack for Scrooged. While the 1988 Bill Murray-led modernization of Dickens’s A Christmas Carol boasted a Danny Elfman-penned original score, it was the pop side of the movie’s diverse musical tableau that garnered the standout soundtrack release. The nine-song soundtrack came out in 1989 and it was bolstered by the Annie Lennox and Al Green duet of the Jackie DeShannon classic “Put A Little Love in Your Heart,” which ended up hitting #9 on the Billboard Hot 100 and #2 on the US Adult Contemporary Chart. The fact that this decidedly non-holiday-themed track was selected as the lead single was actually pretty representative of the rest of the soundtrack, as many of the songs included didn’t have much, if anything at all, to do with Christmas. However, it’s still pretty cool to hear New Voices of Freedom’s cover of U2’s “The Sweetest Thing,” Buster Poindexter’s cover of Van Morrison’s “Brown Eyed Girl,” and Kool Moe Dee’s “Get Up ‘n’ Dance” all included in the same diverse collection. For the more “Christmasy” fare presented on the Scrooged soundtrack, there are a few noteworthy nostalgic nuggets as well. Robbie Robertson’s updated take on The Band’s “Christmas Must Be Tonight” adds synth washes and percussive propulsion to the original’s laid-back groove. While Robertson’s redo sounds appropriately mid-80s in its sonic quality, it still offers a refreshingly original slant when compared to his previous band’s version. Likewise, the smooth electro-jazz version of “We Three Kings of Orient Are” courtesy of Miles Davis, Larry Carlton, David Sanborn, and Paul Shaffer sounds very much “of its day,” while still managing to present a fresh take on an old classic. The album closes with Natalie Cole’s moving rendition of “Mel Torme’s “The Christmas Song,” a holiday standard that was popularized by her father Nat King Cole through multiple recordings throughout the ‘40s, ‘50s, and ‘60s. 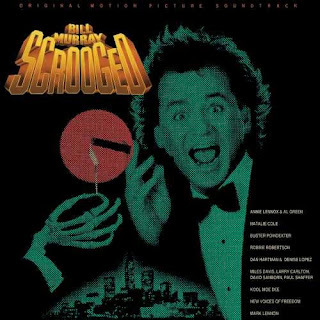 While the Scrooged soundtrack is certainly one of the most non-Christmas-themed-yet-still-associated-with-Christmas holiday albums you’ll ever find, it’s unquestionably one of the “go-to” ‘80’s Christmas staples. For this reason, it’s really nice to see it getting another life on vinyl with this year’s superb reissue.